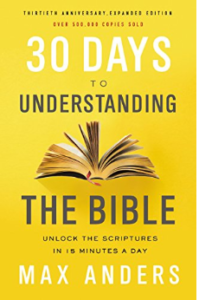 Can you get a good exegetical understanding of the Bible and the theology therein in only a month? Possibly. This is actually an expanded thirteenth anniversary edition of Anders’ book. I’d never heard of it or read it before. It’s fascinating! Like a survey course in college this book goes a little deeper than normal studies but not quite as deep as higher level classes. I read through several and liked the way that he presented the information, allowed for repetition and fill in the blanks and then sometimes allows time for a test. Speaking of time: there is no way that normal readers will get through this in 15 minutes! Some chapters, to be done right, will take 30 minutes or more. There is a lot of data to learn in each chunk. The good news is that the data is worth learning. So the extra time is worth it.